From the first moment of your arrival at our hotel, you will experience our genuine hospitality and the personal contact that we try to have with all of our guests. Those are only a few of the things that differentiate us from other hotels found on the island. By wanting to actively contribute to your relaxation and regeneration, but also to enhance the romantic atmosphere for you, we are in the pleasant position to inform you that we also provide a series of unique services that you can take advantage of during your stay at our hotel. 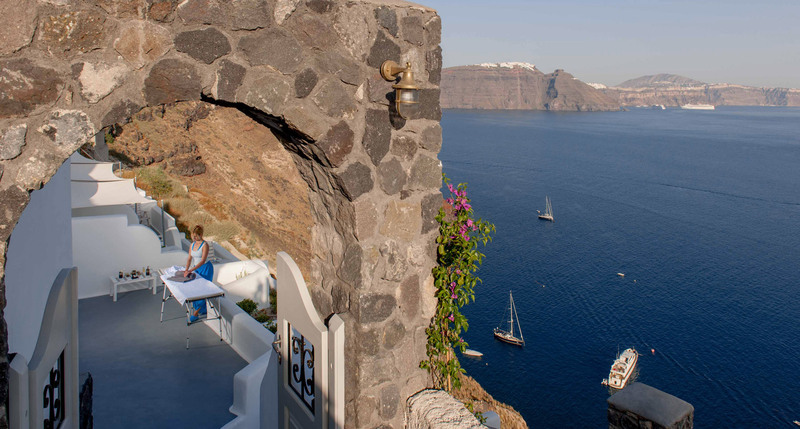 After participating in any of the dozens of different activites available on the island of Santorini, you can pleasantly relax by enjoying a marvelous massage experience. Our professional masseurs can apply on your aching body their rich professional experience and with their hands relieve and relax you gently. You will surely regain in no time your high levels of energy, but in a rather fresher way making you ready for your next activity challenge! You can also attend yoga classes to purify and relax your body and soul. What makes the yoga classes we offer special, is the fact that you can exercise surrounded by the spectacular Santorini landscape. After having relaxed with the massage or yoga class, we suggest you to continue further your regeneration experience by getting a facial beauty treatment, manicure, and pedicure. You deserve to be pampered for you have been working so hard for such a long time. We do assure you that afterwards you will feel an enhanced feeling of satisfaction and pleasure. And the best part is that all the care, wellness & relaxation services can take place at the comfort of your suite. 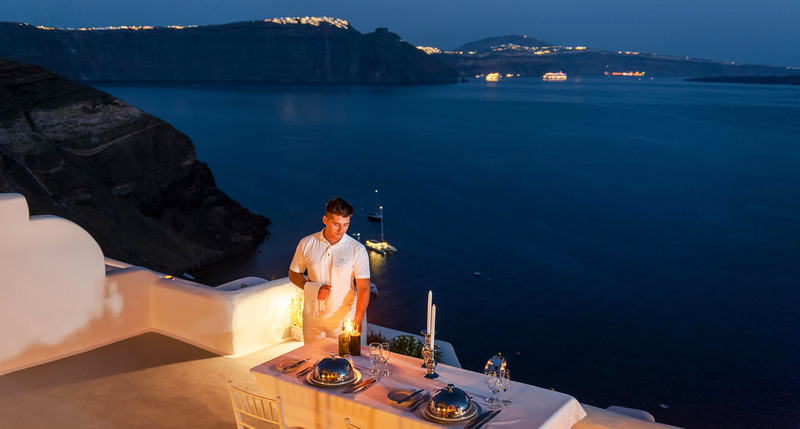 Make your special moments even more special and enjoy an unforgettable experience at the private terrace of your suite under the candlelight and surrounded by the stunning Caldera view. Suitable also for a unique wedding proposal! This will surely be one of your best experiences ever! 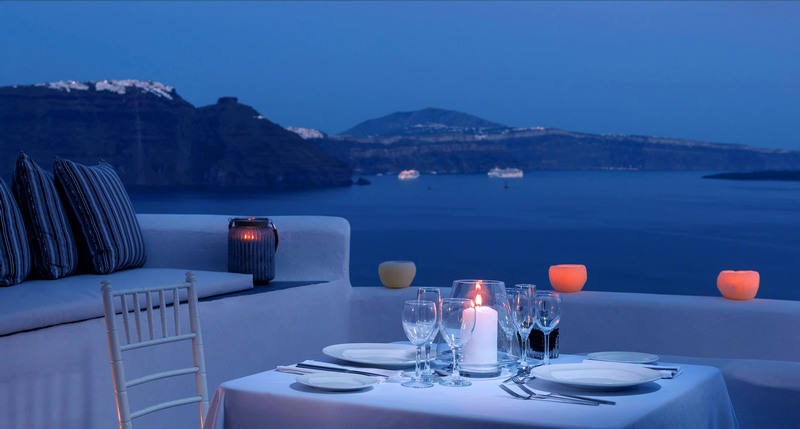 The uniquely stunning Caldera view and the great Aegean sea make an ideal combination for two soulmates to get married. The romanticism, the creativity, and the professionalism of our staff and affiliates will make your wedding a pleasantly unforgettable experience. All the above-mentioned services are available for the suites’ guests, upon request and with extra charge. If you would like, we can welcome you upon your arrival at the port or airport of Santorini. We can fully arrange your transportation to Thirea Suites; just ask for it. The cost of this service from or to these points is € 30 per direction for no private transportation or € 50 per direction for private transportation (this cost is for up to 4 people of the same group).